If you know your time of birth, the chart maker (opens a new tab) can cast the chart for you with the aspects. Then you can come back and check to see if you have any of these patterns in your chart. Configurations or aspect patterns are a series of aspects that appear to make a design of connectivity on the astrological chart. Configurations always involve three or more planets connected together by aspects forming a geometric pattern. I am frequently asked if other points in the chart can be used in the configuration. For example, can the Midheaven or North Node be used, even though they are not planets? I will note that some astrologers do use non-planetary points in the configurations. I do not! I do not use the non-planet points because they typically do not produce the same type of influences that the planets will generate. I am also frequently asked, "What orb do I use?" Unless otherwise indicated in the description of the configuration, I use a standard 7° - 10° orb for natal charts but I narrow down the orb to a maximum of 5° when working on transits or moon event charts for my articles. Many beginning students are drawn to the patterns that the aspects will create upon their chart. It is almost magical to see the individual discover these patterns in their chart. It should be explained that the basic function of the aspect pattern is to tie together a commonality between the signs. Generally the common theme is based on the energies of the Element, Mode and Receptivity (not to be confused with mutual reception). Elements, Modes and Receptives have influence themes that carry across the signs each shares. A good example is the Mode (Quality) and the Opposition. Many students fail to notice that, even though the two signs are opposing energies, the opposing signs do share the same Mode and the same Receptive energies. Thus, the opposing signs are not totally at odds. The two can still work together when the "common ground" is established. Notice the sample chart below. The outer circle highlights the Elements. The inner circle highlights the Modes and Receptives. In the example above, you will notice that Aries (Fire) while opposing Libra (Air) are both Cardinal and Masculine. 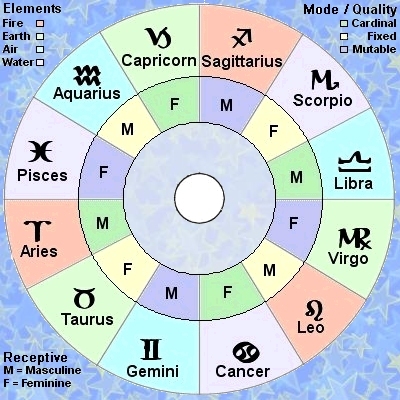 However, Aries (Fire) and Cancer (Water) are both Cardinal, but Aries is Masculine while Cancer is Feminine. The intermediate student should already be aware of these themes and the example is here to help define the themes. However, not ALL aspect patterns will share common themes. There are two instances when configurations are not connected by Element, Mode or Receptivity themes. When planets within the configuration are, by orb, are out of sign, this disrupts the flow of the configuration. For example, in a T-Square, the three planets would normally be located in all Cardinal, all Fixed or all Mutable signs. But the orb will allow a bit of variance (I use the non-technical term of "Slop") so it is possible that the true square aspect is not exactly 90° but can be anywhere from 80° to 110°. Let's use a Cardinal T-Square to explore how one planet can slop out of the Mode. For the example, let's imagine a planet at 27° Aries, another at 5° Leo and the third at 23° Libra. With this T-square configuration, obviously, the Aries and Libra placements are in the Cardinal Modality, but the Leo placement has jumped into a Fixed Modality. This creates an Out-of-Sign T-Square or a Dissociate planet. The Dissociate planet placement disrupts the flow of energies. Dissociate planets would need additional consideration that will not be addressed in this piece. The Grand Sextile example in Part Five demonstrates a Dissociate planet. The second instance of configurations not connected to the themes are the Yods and Boomerang configurations. Those are explained later in Part Six. The overall piece is written for the intermediate to advanced student. The descriptions are brief in an attempt to be concise. This article is not intended to explain all the details of the configurations. Instead, it is designed to be a starting point for continued study. If you have additional questions about configurations, the two best books I have found (although I'm sure there are others) are "Only Way to Learn Astrology Vol II" and "Dynamics of Aspect Analysis." These were my initial resources for learning about configurations. I refer you to these books now because I will not have time to respond to any questions sent to me about this piece.